Senior justice and policing officials are gathering to identify how law enforcement can meet the evolving threat of ISIS (Daesh) as its fighters scatter across the globe. With ISIS having lost most of its territory in Iraq and Syria, the International Conference on Mobilizing Law Enforcement efforts to Defeat ISIS will seek to establish a common understanding of the depth and breadth of the threat. Proven ‘tripwires’ for identifying terrorists, including watchlists, biometric data and finance tracking will be discussed, linked to the need for this information to be shared as widely as possible. INTERPOL’s Executive Director of Police Services Tim Morris said terrorist-related information shared via the world police body was having real impact in the field. “Thanks to biometric data recovered from Improvised Explosive Devices in Iraq and the Gulf and shared via INTERPOL, suspects are now being identified in Europe and Asia,” said Mr Morris. “Warnings circulated via our global network continue to help countries identify and interdict foreign terrorist fighters as they attempt to cross borders. Where we see cooperation, we see results. “We need to make sure that frontline officers get the information they need to take action. A country’s decision on sharing information, a name, a DNA profile, or fingerprints, can make the difference in our global efforts to protect citizens from harm,” added Mr Morris. Participants were briefed on INTERPOL’s Project FIRST (Facial, Imaging, Recognition, Searching and Tracking) which helps countries to enhance security through biometric data sharing on FTFs and other terrorist suspects. A team deployed to Niger helped take photos, fingerprints and DNA from 179 prisoners, which resulted in two hits against INTERPOL’s databases. One of the hits identified an inmate arrested in a terrorist training camp as the same person who had been fingerprinted in a Malian prison in 2014. Building national capacity to conduct checks on the frontlines is an important part of INTERPOL’s counter-terrorism strategy. 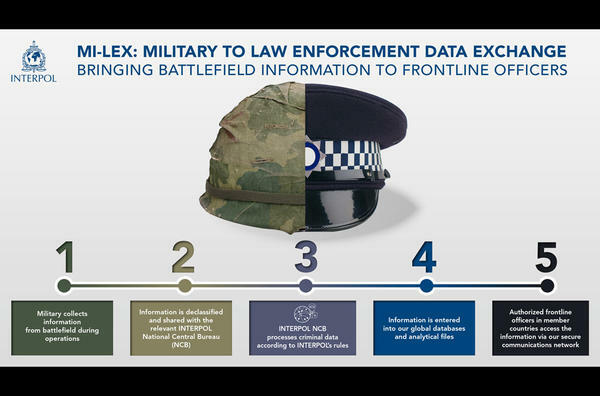 Making sure frontline officials can access the data on nearly 41,000 foreign terrorist fighters currently held by INTERPOL is a vital step in global security. Organized by the US Department of State, INTERPOL and the International Institute for Justice and the Rule of Law, the two-day (27 and 28 February) meeting brings together senior justice and law enforcement officials and their diplomatic counterparts from some 90 countries and organizations.